Small, fragile, and very precious communities of koalas scattered in the forests between Bermagui and Tathra are not only opening doors to their own survival but also the survival of their cousins around our continent. Bega’s Chris Allen has been keeping watch over local populations since 1996, and since 2001 has coordinated a survey and research program through the NSW Office of Environment and Heritage. “Because it’s such a small population, and really widely scattered, maybe 50 koalas over something like 30,000 hectares, it’s been a very difficult project,” Chris says. Bunga Pinch Road marks the northern edge of this key habitat, then extending 10km south to Smith’s Road and Tea Ridge Road, and west to Lizard Road is the main area of koala activity. “But there are other important patches,” Chris says. Two of these koalas have ‘gone viral’ in the last 3 weeks, social media delighted in seeing a strong, healthy looking specimen tramping along the side of the Bermagui – Tathra Road at Aragunnu. “Oh it’s just lovely, it’s a beautiful bit of footage, lovely that people are able to see it,” Chris smiles. “I chatted with that person [who took the video] and in fact, it was just near the Aragunnu turn-off. “He was just driving along the Bermi – Tathra Road, six o’clock in the morning, and here was this koala,” he says. East of this spot is Mimosa Rocks National Park, on the western side there’s a bit of private property, then the newly created Murrah Flora Reserve. According to Chris, there have been four or five sightings in this area, with one koala in poor condition rescued and returned to the wild healthy. “That is one of the few points where koalas are crossing the road,” Chris says. “Slow down a bit, particularly at night,” Chris pleads. And just this week, photos emerged of a young male who was rescued from the waters of Wapengo Lake clinging to the side of an oyster bag. Farmer Brian Orr told Fairfax media, “He was pretty shook up, but he eventually came out onto the boat to get a little bit of sun and warm up. “I was thinking about letting him out, but I called WIRES and they told me to have him checked by the vet,” Mr Orr told Fairfax. How the koala came to be stuck on Mr Orr’s oyster lease is a mystery, perhaps he went exploring at low tide and got stuck. 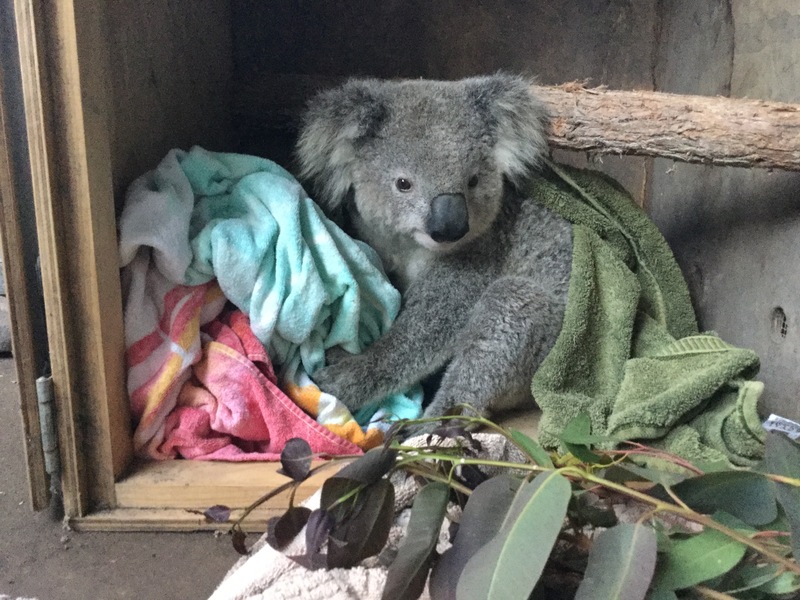 The koala, which was named Briny in honour of Mr Orr and his saltwater experience, had a few days of TLC at Potaroo Place wildlife sanctuary at Merimbula, before being released in bushland north of Tathra on Sunday (Oct 22). While koalas have been making the news lately it doesn’t mean the population is growing. Numbers are still small, in his 7o odd years, Chris says he has only seen five or six. The fact that we know about these koalas and that management practices and response protocols are in place is a testament to a community-based effort that has a sense of magic about it. Part of the initial drive to investigate this population came from forestry workers and local residents. 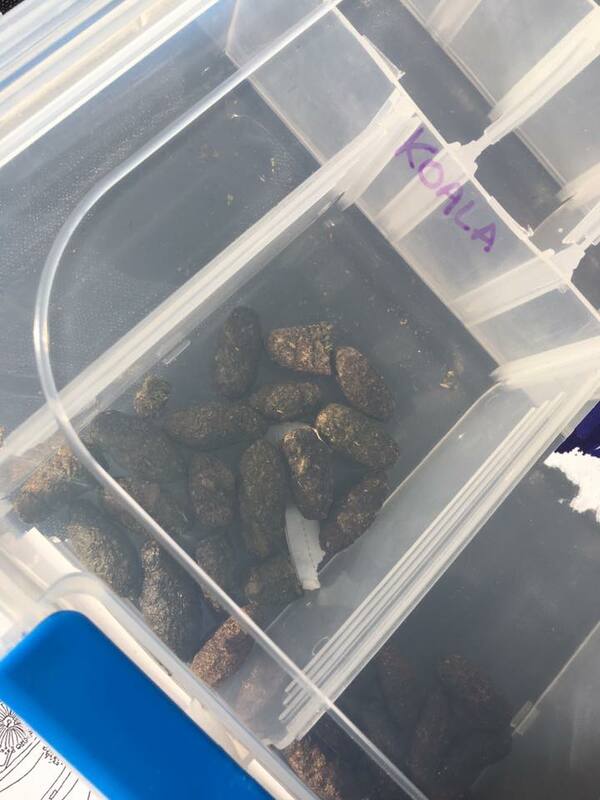 Since 2007 people from a range of agencies and backgrounds have literally been on their hands and knees on the forest floor looking for koala evidence – scats (droppings) mainly. “I get terribly excited about finding koala poo,” Chris laughs. That work has triggered higher level scientific research that is shaping future koala management in South East New South Wales and beyond. “Since the 1960’s koala numbers in these coastal forests have been shrinking, and shrinking from the north,” Chris says. Research has suggested that the decline has continued southwards – until you hit the Murrah River. South of the river that ‘hands and knees’ bush survey work points to a population that is at least stable and has been so over the last decade. Sydney University has added its weight to the investigation looking into the secrets of this southern population. “The way that’s done is that any time we find fresh koala poo we send it off to Sydney Uni and they are able to extract DNA,” Chris explains. Genetic mapping is a part of the information recorded but so too is a snapshot of disease. “What has come out of that research is that to the north of the Murrah River animals are carrying chlamydia but to the south – they’re not,” Chris says. Explaining how and why that is the case remains unresolved, the results of this work are very preliminary. “The koala is described as a chlamydia rich organism, the population is often carrying several different strains,” Chris says. Chris believes the isolation of this southern population might be a factor in its survival which makes the management of their landscape more critical. “We’ve picked up evidence of four perhaps five females breeding, we know where their home range areas are, ” Chris says. Habitat destruction has been one of the issues facing koalas across Australia, these particular Bega Valley marsupials received some respite from the NSW Government in March 2016 when the forests they were living in were protected from further logging with the creation of the Murrah Flora Reserves – taking in what was the Murrah, Tanja, and Mumbulla State Forests, and the southern section of the Bermagui State Forest. “Almost certainly the greatest threat this population faces now is a major wildfire,” Chris says. Managing that risk now drives a collaboration between the Rural Fire Service, the National Parks and Wildlife Service, local residents, and the Aboriginal community. “We’ve been through a research project with the University of Melbourne where they’ve run what’s called fire simulation modeling,” Chris says. The results highlight the likely progression of fire through this landscape, pinpointing areas for fuel reduction work. 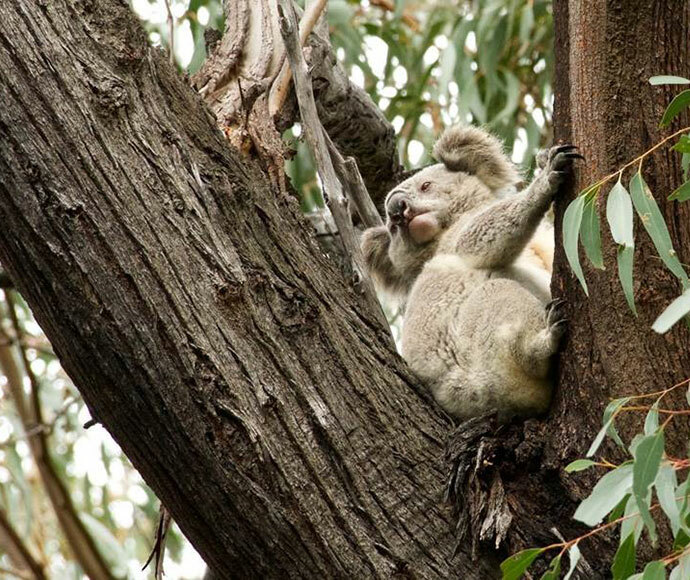 In turn, the threat to koalas as well as human life and property is reduced and the capacity of an effective response in the event of a wildfire is improved. “Koalas can be very good neighbours,” Chris laughs. The board managing the Biamanga National Park, which is made up of traditional owners, are keen to take on that key role of reducing the fire risk. “For many years they have wanted to introduce a cultural burning program and I strongly support this,” Chris says. “The way they see it is on two levels, one is to make an ecological contribution and [two] to provide opportunities for Aboriginal people to be working back on country. “Within it [cultural burning] is the idea of small, low-intensity, patch burns, small terms just working over a long period of time,” Chris says. Aside from fire, climate change is the other looming threat to these precious creatures – it’s change that is literally turning the koala’s stomach. “It’s fairly clear that increased carbon dioxide levels are actually reducing the palatability of eucalypt foliage,” Chris says. The fear is that the pressure of climate change on local forests will cut the number of suitable feed trees available. “These koalas are widely scattered because there are only relativity few trees providing adequate nutrition,” Chris believes. Increasing the number of suitable species like Woollybuott is another ‘rod in the fire’ of this conservation project. “Woollybuot is really struggling to regenerate,” Chris says. Thirty small research plots have been established throughout koala country where a range of bush regeneration techniques are being trialled – one of them is the use of seed balls. “Seed balls are made up of the seed of the target species, clay is mixed with peat mulch and Cayenne pepper,” Chris smiles. A solid clay ball is the result which sits in the bush waiting for good rain. “Now it’s a question of monitoring and seeing what is most effective in encouraging the regeneration of Woollybuot and other preferred browse species,” Chris says. Using this research in conjunction with cultural burning; regenerating burnt areas is the long game. This relatively small forest holds big potential, not just for the survival of the koala according to Chris but so many other species. “If we can’t hang on to our koala populations we are in big trouble,” Chris says. “This population is a real litmus test as to what we can do about koala conservation nationally, this is a nationally significant effort. “This is not just about koalas, the conservation initiatives that flow around the management of koala populations are conserving a whole lot more,” he says. The success of this work so far has been the amount of knowledge collected and cooperation around better and more careful management of these forests. It’s understood that the NSW Government will release its NSW Koala Strategy before the end of November. A whole-of-government approach Environment Minister Gabrielle Upton hopes will stabilise and start to increase koala numbers around the state. The work of Chris Allen and dozens of other locals have contributed to that process – advice that gives the koala a fighting chance. While the survival of the koala is the main game, this locally based 10-year project has already had a big win. Its magic has seen a coming together of community will, good science, and politics. “This is a population on the brink, it’s the last one we’ve got here in the coastal forests of the Bega Valley, let’s do what we can, we owe it to them given their history,” Chris says. About Regional content is supported by the contribution of members – thanks to Julie Rutherford Real Estate Bermagui, Tathra Beach House Apartments, Claire Blewett, Neroli Dickson, Jeanette Westmore, and Nigel Catchlove. Fascinating and both alarming and inspiring. Best wishes. Thanks to Chirs for his great effort and passion to conserve this precious koala population. Hope every Aussie follow suit! Excellent article. Thanks to Chris for his tireless efforts for the local koalas. It is so exciting every time a new one is spotted. Thank you Chris Allen and all that you do for the Koalas in our region (and others). Great story - telling it like it is.